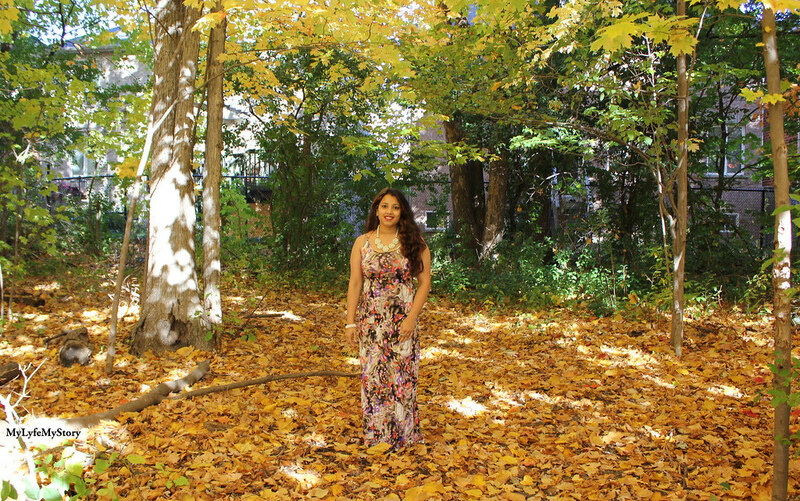 This Mocha Sleeveless Animal Print Maxi Dress from AMIClubWear was just too beautiful, so decided to find an unique place in Toronto for this particular shoot. Please note, we did received permission from City of Toronto to take this photos in one of their natural reserved areas. 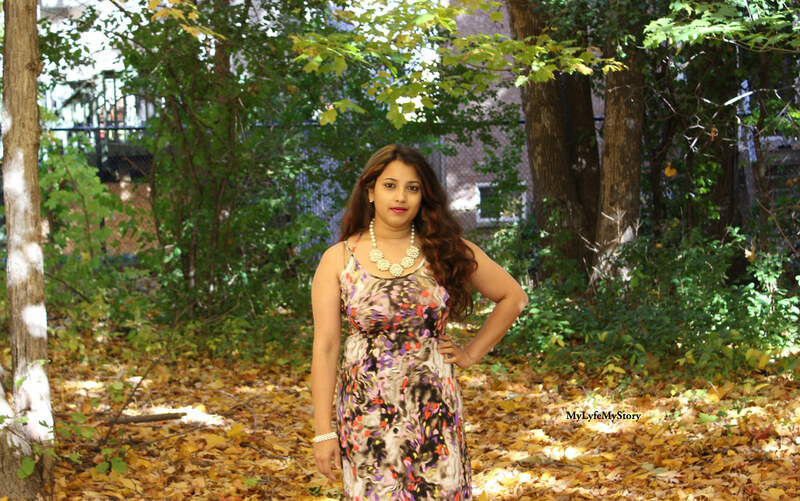 Recently wore this Mocha Sleeveless Animal Print Maxi Dress from AMIClubWear. I wore the Mocha Sleeveless Animal Print Maxi Dress to the Guess Spring/Summer 2016 Collection Preview event and during the event I had many people comment about this dress. This is a one of a kind animal print, featuring a sleeveless scoop neckline, back strappy detail (one of the best details), and a comfy as well as fitted. As mentioned one of the biggest highlights of the Mocha Sleeveless Animal Print Maxi Dress was the strappy back. The back of the dress tends to pull all the attraction. 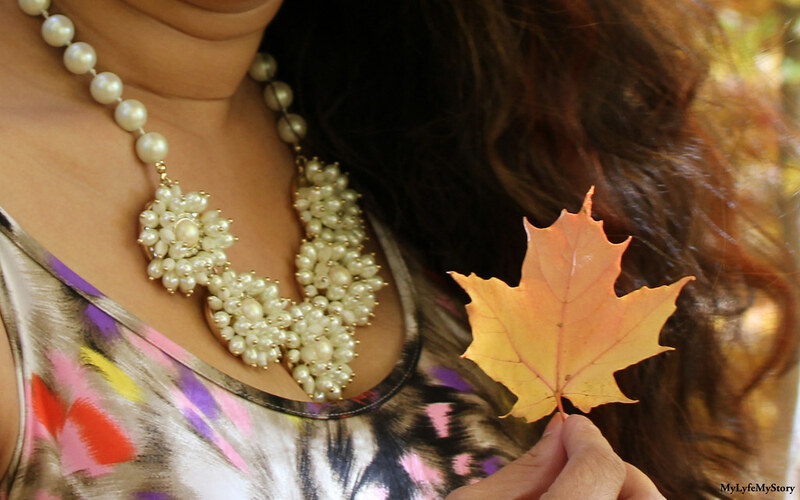 As mentioned in my post yesterday, the Glamorous Pearl Statement Necklace from Happiness Boutique. Definitely one of my favourite pieces and it is a glamorous as well as an elegant, this pearl inspired necklace is a must have for your gala dinner or any formal occasions. This finely crafted and intricate flower pearl necklace is certainly a unique statement piece. Check out Happiness Boutique for more necklaces and even some beautiful earrings. Honestly the earrings really caught my eye too as they are all so amazing an very affordable. I think there are so many beautiful pieces of jewellery to pick from and they are so unique. You honestly cant beat the price either and the quality is amazing. I kept the focus on the colourful theme from the Mocha Sleeveless Animal Print Maxi Dress and paired the outfit with Black Metallic Pointed Toe Flats Faux Leather from AMIClubWear.. The Black Metallic Pointed Toe Flats Faux Leather is perfect to slip into. These adorable flats that features a faux leather upper with a pointed closed toe, scoop vamp, ankle strap with side buckle closure, smooth lining, and cushioned footbed. Extremely comfortable and perfect for an occasions. I love pearls and this is one of the perfect earrings that focuses on the beautiful pearls. 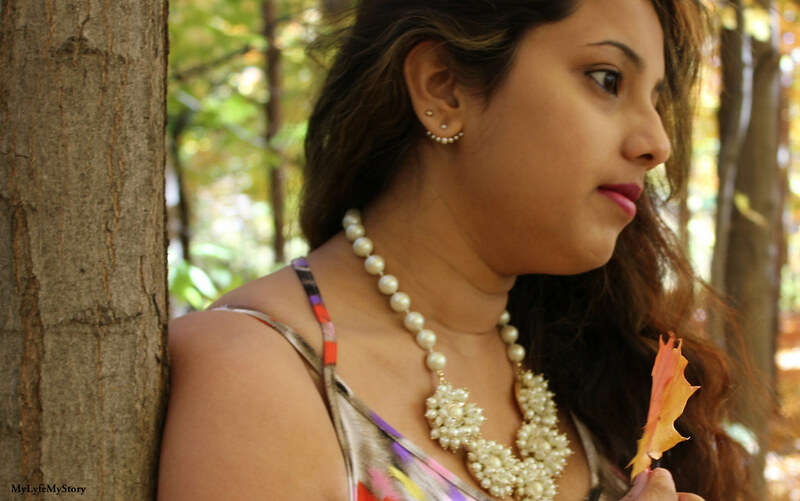 This Palm Shaped Ear Studs Gorgeous Pearl Earrings are from BornPrettyStore. This is officially my last outfit post for Fall 2015, as of today I will be starting my Winter 2015 looks as its actually snowing outside!! 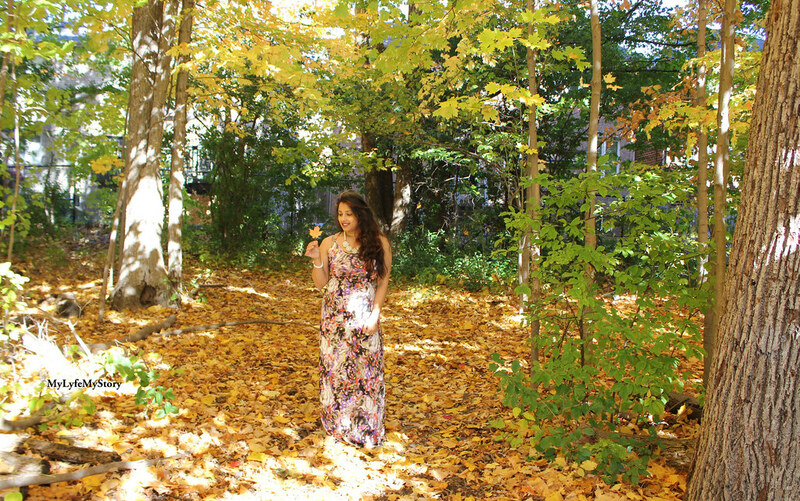 Hope you all enjoyed my last Fall 2015 outfit! You look so prettty and romantic! Aww, You are wearing the necklace. The necklace is more beautiful when you're wearing it. I think the dress and the location is perfect together. 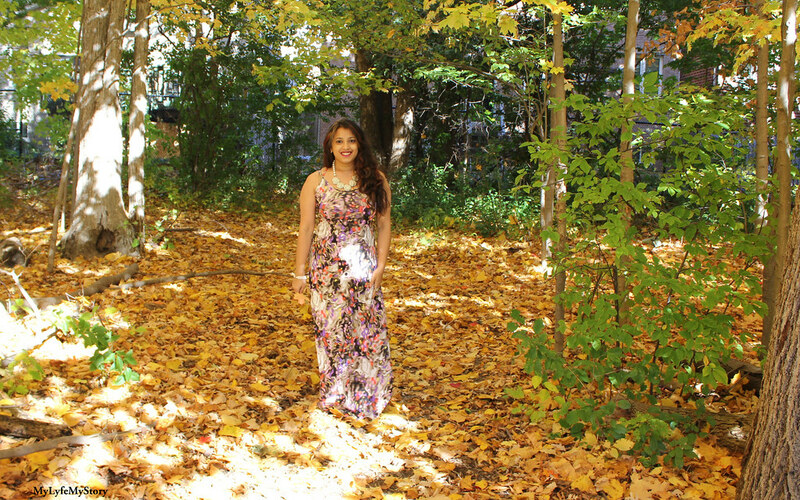 Your look beautiful in your dress in the fall environment! Wow, this dress is lovely. You chose a great spot for your shoot. Hi dear!!! I love your blog!!! Gorgeous! 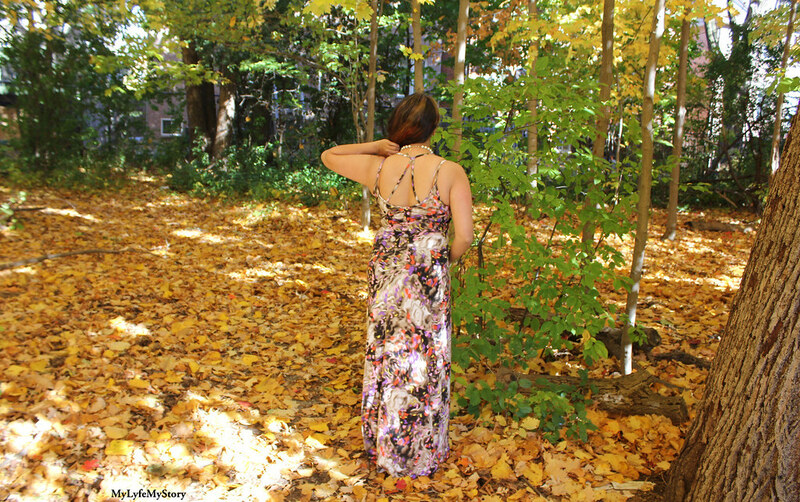 Love this maxi dress on you! Oh you are so lovely, dear! Your outfit posts are always wonderful. Very pretty dress and you look amazing in it. Such a beautiful and gorgeous body and the back shots are so wow!! Such a beautiful dress Harija!! love the scenario! 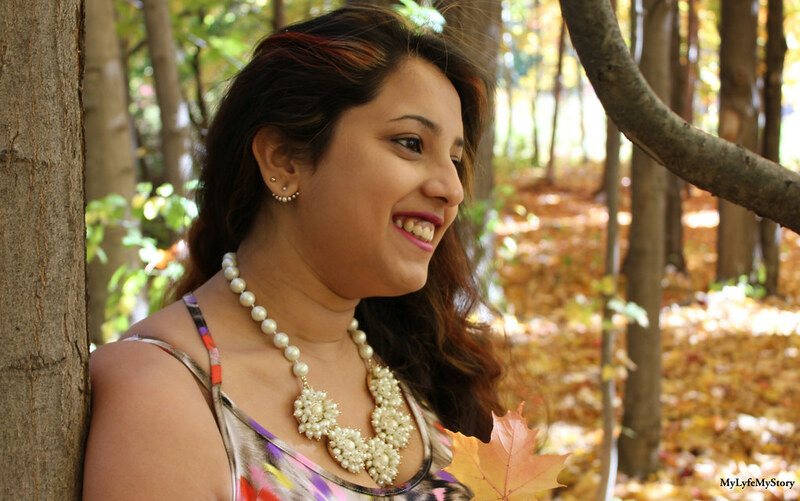 This maxi dress and the pearl necklace looks gorgeous on you, beautiful style! What a beautiful print and great photos too! You look marvelous. Love your dress! 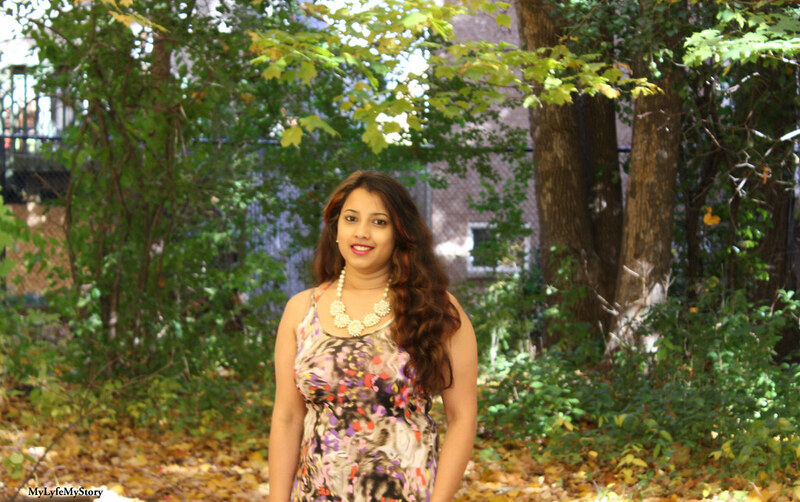 The print maxi dress is so beautiful and so are you Harija!! I love the accessories that you paired with, extremely gorgeous! hello dear , your blog is really nice and your posts are very interesting . would you like to follow each other ? follow me and I will follow you with pleasure . see you soon. you look so good..love your shoes and the setting as well.. This dress is beautiful - I love the colours! !